Yesterday began a journey I’ve been looking forward to for several months. My oldest daughter is getting married in Seattle, Washington next weekend. My wife and I wanted to arrive in Seattle on the Monday before her wedding so we could help her with last minute details. Somebody (the general consensus is that it was me) decided we would need a vehicle while in Seattle and it would be cheaper to drive our own than it would be to fly out and back and rent a car while we are there. This plan evolved into me driving to Seattle from Ohio by myself and my wife and youngest daughter would fly out and ride back with me. So, I will spend about forty hours of driving time Friday through Monday while they spend seven hours flying on Monday. You probably think I am crazy. Quite the contrary. I have not taken a multi-day road trip by myself in over thirty years and I have been eagerly anticipating driving west. I get control of the stereo, I get to stop where I want, not stop when I don’t want to stop, eat French fries while I’m driving, and throw my trash in the back seat. For four whole days. Yes! Day one’s way point destination was Olathe, Kansas, home of another daughter and her husband. Six hundred and forty miles beginning at home in Ohio, across Indiana, Illinois, Missouri and ending just into Kansas. Ten hours of driving time including routine stops plus one special stop for one hour. As I was driving across Indiana I remembered visiting, as a tourist a couple years ago, the Cathedral Basilica in St. Louis, Missouri, and what a beautiful church it is. So, at a pit stop just outside Indianapolis, I logged onto masstimes.org to see if by chance they would have a mid-day mass at the cathedral. Sure enough, there was one scheduled for 12:05 p.m. I plugged the address into my GPS and, believe it or not, it said my ETA would be 12:05 p.m. Is that a God moment or what? I arrived at 12:09 p.m., but would have been on time had it not been for highway construction in Illinois. The cathedral was just as beautiful and awesome as I remembered it. It will seat thousands of people and this day there were probably about 200 people, mostly tourists and folks who looked to be passers-through like me. I occupied a pew with a young couple and their young daughter, and another young mother with three even younger daughters. We had never met before and probably never will again but we all held hands during the Our Father. We were our own little microcosm of Christ’s body there to worship and receive Holy Communion in this magnificent church. The St. Louis Cathedral Basilica was begun in 1907 and was completed in 1988 – eighty one years in the making. The cathedral is of Romanesque architecture on the exterior and of the Byzantine style on the interior with three huge domes, a transept and four special chapels. But what really makes the cathedral unique is its interior mosaic art, over 83,000 square feet of glass tile artwork, 41.5 million pieces of tile in all in more than 8,000 shades of color. It is stunningly beautiful. You can see some photos of the cathedral, inside and out, by visiting the Cathedral Basilica at St. Louis website http://cathedralstl.org/. After mass and after exiting the church I walked through some of the adjacent garden on my way back to my car. 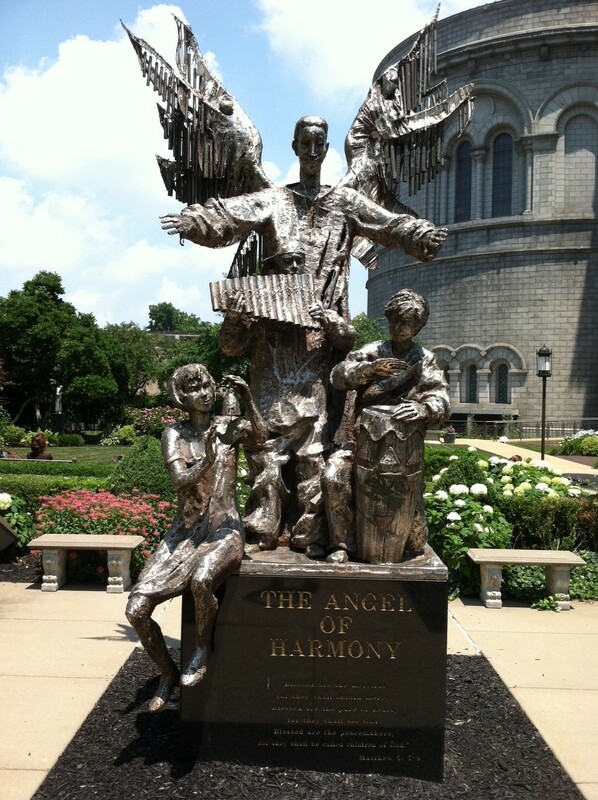 There, I found a sculpture entitled The Angel of Harmony with the first three Beatitudes inscribed on the front of the sculpture’s base. These are poignant words that are right on the mark and are as important today, if not more so, than they were over fourteen years ago. I made it to my daughter’s house in Olathe, Kansas with no trouble. She had a marvelous dinner waiting for me and we had a great time visiting and talking about the upcoming wedding. All in all, it was a blessed day. Today’s destination – my sister-in-law’s house in Rapid City, South Dakota! I wonder what unexpected revelations God has in store for me today? 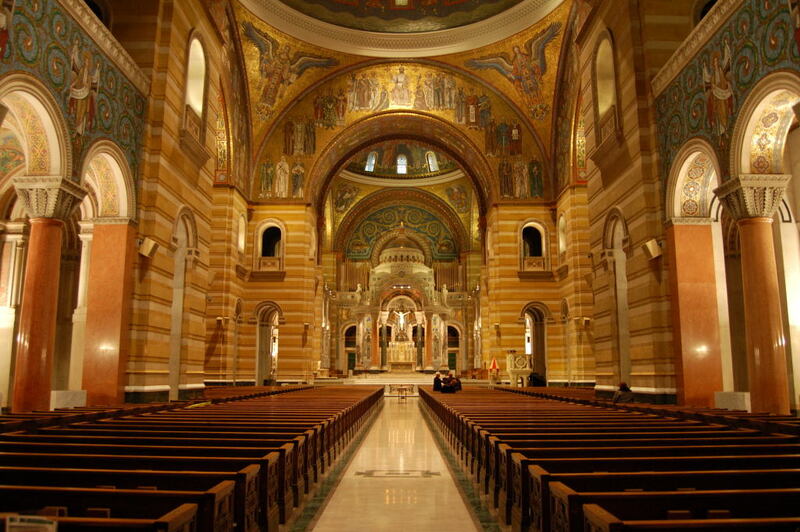 If you’ve ever visited and/or toured the Cathedral Basilica in St. Louis, let me know what your impression was. I would love to hear about it. What a terrific opportunity to commune with the road, with nature, with family and most of all with God. Good luck on your trip, travel safe and God bless. Thank you, Gary. It’s been a peaceful trip so far. Getting to commune in all four ways you suggested. Stay tuned for more!